Noela Rukundo, an Australian woman, returned to her native Africa to travel to Burundi to attend her attend her stepmother’s funeral when she was abducted by a gang of men. They had been ordered by her husband of 10 years to kill her. The amazing part, she was spared by the hitmen with principles. Hmm, I guess there is sometimes honor among thieves. After having kidnapped her, the men said, they weren’t going to kill her, they didn’t believe in killing women. Instead, they called the husband and told him the job was done. According to Australia’s The Age newspaper, two days later, they set her free on the side of a road, but not before giving her a cellphone, recordings of their phone conversations with Kalala, and receipts for the $7,000 in Australian dollars they allegedly received in payment. Noela Rukundo was presumed dead by her partner and their entire community who held a funeral in her home in Melbourne, Australia, in her memory early last year. Much to all of their surprise, after all of the mourners had left, she approached her former love who was under the impression that his wife was not only dead, but that he had got away with his murderous plan. That’s when she approached him and replied, “Surprise! I’m still alive!” Her husband looked like he’d seen a ghost. Eventually, her husband, Balenga Kalala, pleaded guilty and was sentenced to 9 years in prison. Balenga Kalala, who arrived in Australia in 2004 as a refugee, paid almost $7,000 to a group of kidnappers to kill the mother of his three children, Noela Rukundo, when she was attending her stepmother’s funeral in Burundi in early 2015. The group snatched Ms Rukundo at gunpoint outside her hotel in Bujumbura in February and drove her to a secret location. Multiple hostages have been held in a Sydney, Australia cafe by a gunman in what appears to be an Islamist-linked attack. Australian police locked down the center of the country’s biggest city on Monday after an armed man walked into a busy downtown Sydney cafe, took hostages and forced them to display an Islamic flag, igniting fears of a jihadist attack. Police said they knew of one armed assailant involved in the incident at the Lindt chocolate cafe in the heart of Sydney’s financial district, but there could be more. A gunman is holding staff and customers hostage at a cafe in Sydney, Australia. The Lindt cafe in the city centre is surrounded by armed police. Officers have made contact with the gunman. Five people have been seen running from the building. It is not clear how many remain inside. A black Islamic flag has been displayed at the window. Prime Minister Tony Abbott said it was “profoundly shocking” that people were being “held hostage by an armed person claiming political motivation”. He was speaking after chairing a meeting of the national security committee in Canberra. 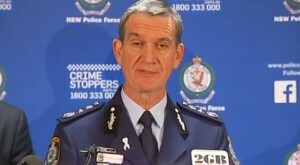 Senior police officers say they are on a footing “consistent with a terrorist event”. UPDATE I: ABC – Australia. UPDATE II: Five people flee from Sydney cafe amid hostage drama. Australia’s Prime Minister Tony Abbott said the gunman was “claiming political motivation” but after more than 15 hours had yet to declare the siege a terrorist event. However, police said they were “operating according to our counter-terrorism protocols” and NBC News analyst, ex-FBI-agent Don Borelli, told TODAY that the suspect appeared to be inspired by ISIS. Chris Reason, a journalist with NBC News’ Australian partner Channel 7, said the hostage-taker was “forcing them to stand against windows, sometimes two hours at a time.” He added that the suspect seemed to be “getting extremely agitated” after the five hostages left. Police would not confirm how many were still being held inside the Lindt cafe — where a black flag used by Islamist groups in the Middle East has been shown in the window. UPDATE IV: Sydney siege: Gunman issued demands, threats. UPDATE V: Sydney siege: Three dead after commandos storm cafe. Local media have named those who died as Lindt cafe manager Tori Johnson, 34 and lawyer Katrina Dawson, 38. Four people were injured, including a policeman hit by shotgun pellets. Central Sydney was put in lockdown as the gunman, identified as an Iranian refugee, seized dozens of hostages early on Monday. The Lindt Chocolat Cafe is located in Martin Place, a busy shopping area in Sydney’s financial district. 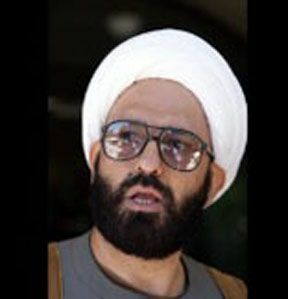 The gunman, named as Man Haron Monis, forced some of the hostages to hold up a black Islamic banner at the window of the cafe.